I have been a camper since before I can remember. My dad's side of the family has been camping in the same place since he was little. (I'm keeping that place a selfish secret, because it is my heaven and I need to keep it sacred and private...sorry!) Even given all my years of camping experience, I was nervous about camping with my son. I thought it would be so much harder, so I put it off much longer than I should've. 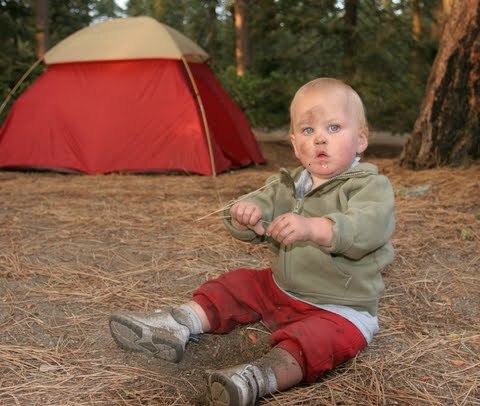 With experience, wisdom from my family (including an aunt who is mom to seven of my cousins, one of whom came out with us when he was just 6 weeks old), and tips from Jennifer Aist's Babes in the Woods, I've learned a bit and thought I'd pass it on to those of you who would also like to camp with your babes this summer. - Don't bother bringing toys. Nature is one giant toy! - Check the weather and pack accordingly. Pack layers. Pack only one extra item of each clothing type. Don't go crazy. - Don't over-plan. You don't have to have a hike, bike ride, swim session, and canoe ride planned for every second of the day. Throwing rocks in the lake will be fun for a long time. Just enjoy your surroundings. - Wear your babe in the way most comfortable for you. There is no real need for a fancy backpack carrier when you have a perfectly good Moby already. - If your babe is old enough, teach him or her to drink out of your CamelBak before you go on your trip. It can be tricky to get the hang of at first and you want everyone to be hydrated. - You can still cosleep in your sleeping bag. No need for extra bags for babes. - You can still cloth diaper if that's what you normally do. Just bring a larger wet bag. If you'd rather, switch to g-diapers for the trip, so you don't have to feel the guilt of using disposables, but can still have the convenience of trashing them as you go. - Hats are a must. - Be wary of bug repellants. Do your research. They definitely come with risks. Avoid DEET. - Don't bother trying to keep babe clean. Just don't. - If biking, wear helmets and make sure they're on properly. - If in or near the water, fit babe with a life jacket and keep it on at all times. - First aid, first aid, first aid! Have a kit and know your stuff. Chances are you won't need any of it, but if you don't have it, you're sure to need it. - If biking, use a trailer, not a bike seat. Trailers are 40% safer than seats. - Bring a disposable camera so babe can take pictures, too! - Breastfeed and there's no need to bring bulky extra food. Score! It's really nowhere near as intimidating or difficult as I thought it was going to be. Sure, things take a little longer, but that's the nature of being a parent. Sure, you have to fill your car just a little bit more, but not much, since nature provides most everything you'll need. The truth is, though, any inconvenience is marginal and doesn't even compare to the beauty and wonder of learning to camp all over again with your babe. Oh, I almost forgot my most important tip: Relax and enjoy. It's really that simple! A moby is only good for small babies. Stretchy fabrics are unsafe for bigger, mobile babies. You need a woven wrap. Please do your research before you suggest things like that to mothers! I use a Moby for my 16 month old, no problems. Each person has their own preference and I believe if tied properly, why would it matter woven or Moby? Just my personal opinion! I happen to love this post! New follower to Zen Parenting! I think the posters concern is that stretchy wraps are NOT SAFE for back carrying no matter how its tied. (http://www.youtube.com/watch?v=J19oOkQ61hI&feature=youtube_gdata_player) so correlating it with a "backpack" style carrier may confuse newer or inexperienced babywearers. Though they are rated for up to 35lbs, its not recommended past about 15lbs for comfort and somewhat for safety as it would have to be adjusted quite frequently to keep it snug and secure with older kiddos. If I put my 35lb toddler in the stretchy wrap that I have kicking around, even in a front or hip carry, he could easily lean out of it and fall quite quickly, whereas in a properly tied woven wrap or soft structured carrier, he's not going anywhere(and I can carry him for hours if needed). Stretchy wraps are awesome for smaller babes though! The Moby is a suggestion, as if everything else in the post. It's what I used when I babywore. Use whatever you want. However, I've done my research. It's good for up to 35 pounds. My almost 2 year old is only just over 25 pounds. Any way you could find one thing positive to say rather than read an entire article and pick out one thing to criticize? Thank you for this article! I'm 9 months pregnant with my 3rd boy and I'm looking to calm myself about camping at this stage. Your post helped to remind to relax and enjoy as it's our last family outing before our 3rd little joins our family. We've taken our 15 month old daughter out about once a month since she was 6 weeks old, even for a 3 day backpacking trip and she really enjoys it. You're right about not needing much for babies. Also about camelbacks, I gave mine to her when she was really little as a chew toy and she figured it out herself. I've never used disposables, but cloth diapers are pretty easy and much cheaper. I'm also happy I did 'infant pottytraining' too, it has cut diapers dramatically and we are well on our way to being potty trained.. I'd like to find a good bug repellant for this mosquito season. Do you have any you recommend? the no toys thing is SO true. a few years ago with my first, i brought tpys but it was no use lol nature wins! just dont bring electronics! im sort of allergic to deet. going to go check out your post about that. we are going camping for thanksgiving ( we are in florida so its just chilly lol) but we are doing it as a family reunion type event. i look forward to it. although, i volunteered to watch all the kids! what was i thinking!? I have been experimenting with various essential oils as bug repellents and with good luck so far! There has to be a nit picker in every group. Boo to that person. Suggest whatever you want. It's up to the people to research what's best for them. If they go off one persons blog and it doesn't work, then maybe that's their problem. Thanks for the tops btw. We're going camping in a few weeks in the cold. Mg boy is going to be seven months when we go. I'm a little nervous. Thank you for this, I'd love to go camping but haven't been since I was little. Re the cosleeping, how does it work? I have a 2yo and a 3 month old, cosleep with both.. could one stay with daddy and one with me, would there be enough room in the sleeping bags?